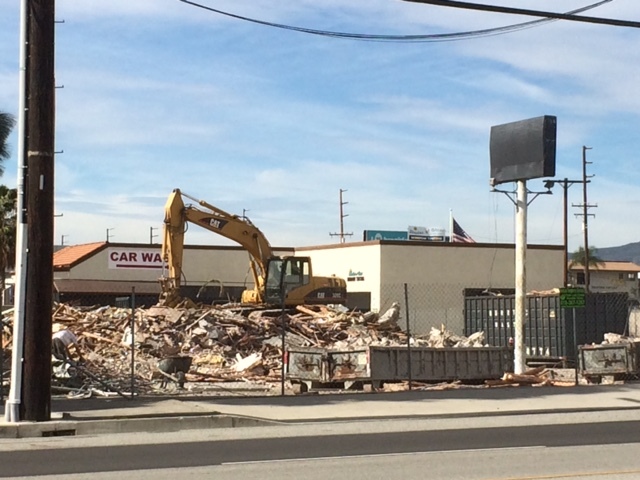 A former adult bookstore building was being torn down last Thursday on Central Avenue below Foothill Boulevard in Upland. It was once Mustang Books and Video, a thorn in the side of Upland City Hall and residents. The area was outside city limits for most of its existence. San Bernardino County negotiated the 2010 closure of the store, which had bedeviled them since at least the 1990s. And now, the vacant building is nearly gone. Its black-wrapped pole sign seems to be in mourning. Well I say the Upland Planning Commission(if there is indeed one) should go for the trifecta and have someone build a combination pot dispensary-tattoo parlor-lingerie shop on the vacant site. Oh wait…I forgot…the city is already full of those. Then maybe a Pakistani restaurant that specializes in soup…mutton…and marble rye. And Snickers bars on plates, and Junior Mints, and big salads, and fattening frozen yogurt.